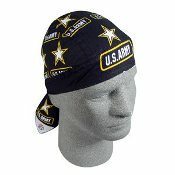 The US Army Flydanna is a bandanna, cut into 6 panels and sewn into a head wrap, with a tail and ties at the nape of the neck. It is designed to sit securely on the head using the attached ties, allowing one size to fit all. Flydannas are great under a helmet as a moisture barrier as they help to isolate grease and sweat from helmet liners. Tail protects neck from the sun. 100% cotton. One size fits most.